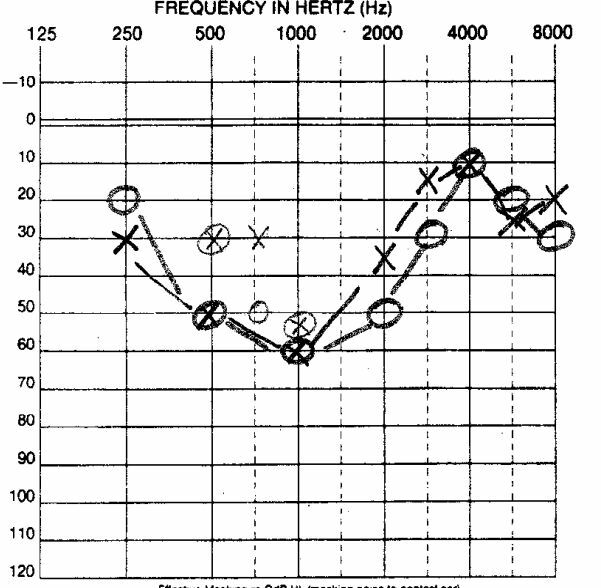 Hearing loss (in general) -- some specific frequency patterns are below. There are many patterns of hearing loss. 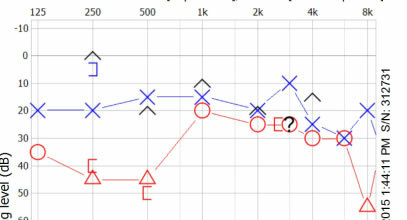 Generally clinicians group them along several axes; sensory vs conductive; the severity axis -- mild vs moderate vs. profound; the time axis -- sudden vs progressive vs chronic, and the frequency spectrum that is affected. Roughly speaking, the frequency patterns of hearing loss are divided up into: Low-frequency, mid-frequency, high-frequency, notches, and flat. There are also combinations of the above -- mainly the "peaked", or perhaps inverse-cookie bite, which is a mixture of low and high-frequency, sparing mid-frequency. 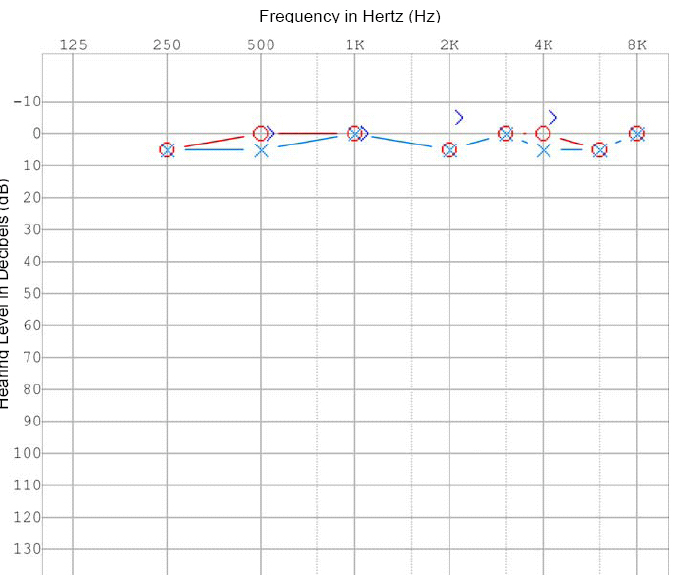 Low frequency (Meniere's) Middle (or "cookie bite") centered on 1K High-frequency loss, beginning at 8K Flat hearing loss in both ears, R is worse. Here we are discussing only low-frequency sensorineural hearing loss. This group appears to be distinct in demographic features from the more common "sudden hearing loss" that frequently affects all frequencies (flat), or just high frequencies. (Yoshida et al, 2017). Nevertheless, some types of "sudden hearing loss" affect low tones. As an overview, low frequency (or tone) sensorineural hearing loss (LF SNHL or LTSNHL) is unusual, and mainly reported in Meniere's disease as well as related conditions such as low CSF pressure. There are a few "one-off" reports in central conditions such as Susacs, vertebrobasilar insufficiency, just old age, and periventricular leukomalacia. There is a large literature about genetic causes, mainly in Wolfram's syndrome ( diabetes insipidus, diabetes mellitus, optic atrophy, and deafness), probably because it is relatively easier to publish articles about genetic problems. These are basically papers about LTSNHL without a clear cause - -thus might also be termed a low-tone variant of SHL. SHL is a "wastebasket" type of hearing loss (see here for more). Asakuma (1999) reported 241 patients with acute low-tone SNHL. These patients were largely young females. He defined LTSNHL as that the sum of the three low frequencies (125, 250, 500) was more than 100 dB, and the sum of the 3 high frequencies (2, 4, 8) was less than 60 dB. Jun et al suggested prognosis in SHL was better for the low-tone hearing loss variant (2012). This seems reasonable enough. Le Prell et al (2011) suggested that low frequency hearing loss was detected in 2.7% of normal college student's ears. We are dubious that this has any significance. We think it is probably just "noise". Oishi et al (2010) suggested that about half of patients with LTSNHL developed high or flat hearing loss within 10 years of onset. The new international criteria for Meniere's disease require observation of a low-tone SNHL. To us, this seems a little overly stringent, compared to the earlier 1995 AAO criteria that just required any kind of hearing loss, but criteria are better than no criteria. Belinchon et al (2011) reported that Meniere's disease show an "inherent upward sloping configuration", after correction for patient's age, at all points. Brannstrom et al (2008) reported that Meniere's patients fluctuate at low-tones. Gatland et al (1991) reported fluctuation in hearing at low frequencies with dialysis was common, and suggested there might be treatment induced changes in fluid or electrolyte composition of endolymph (e.g. part of the hydrops story). Rahko et al (1990) suggested that "in Meniere's disease the whole cochlear sensory area is affected, and that the damage caused by Meniere's disease advances simultaneously in all parts of the cochlea." 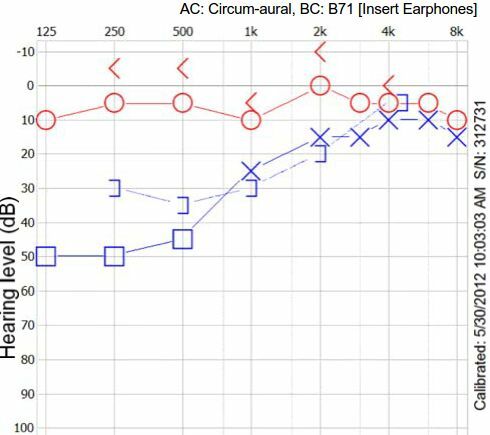 We disagree ourselves - - in Meniere's, hearing loss starts at low frequencies. Furthermore, we don't see that hearing loss automatically means cochlear damage either. Although OAE's are generally obliterated in patients with hearing loss > 30 dB, for any mechanism other than neural, this is not always the case in the low-tone SNHL associated with Meniere's disease. 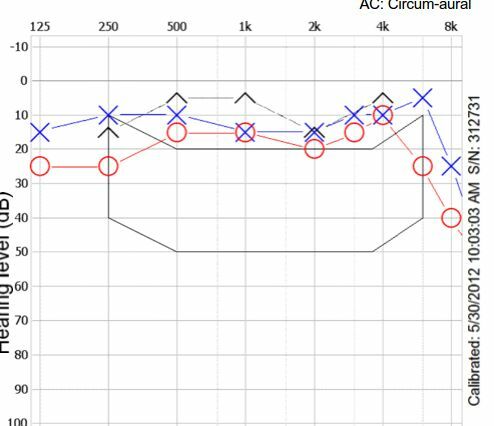 Audiogram (classic early Meniere's) High-resolution OAE, same patient, same day. The distance between red and black line is a measure of the strength of the OAE. This patient has excellent OAE's at low frequencies. The lack of universal correspondence between audios and OAE's in low-tone SNHL in at least some patients with Meniere's, suggests that the mechanism of hearing loss may not always be due to cochlear damage. We have also encountered patients with "miraculous recoveries" of hearing in Meniere's, again suggesting that in some patients, the cochlea must be still intact. Where might the injury be ? One wonders if these patients reflect a different (perhaps better prognosis mechanism). There is a small amount of evidence that LTSNHL may be central (see below). Could these patients have brainstem hearing loss ? 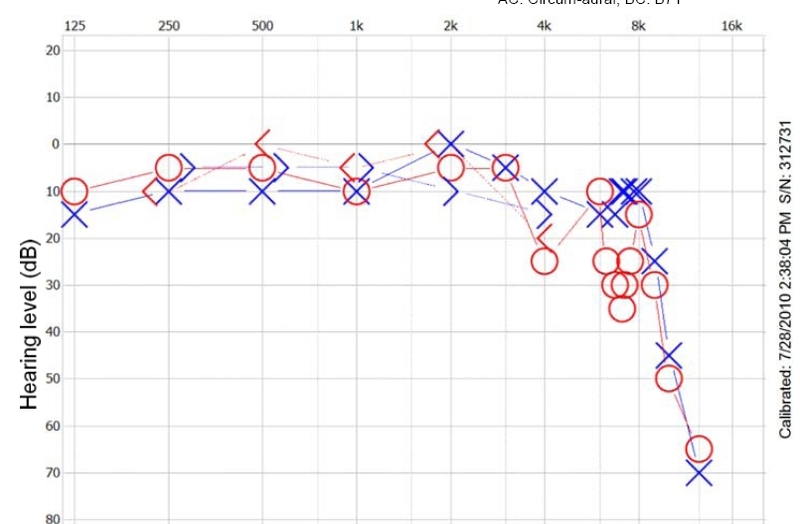 Of course, in a different clinical context, one might wonder if the patient with the discrepancy between OAE and audiogram might be pretending to have hearing loss. We would strongly doubt this, but it is possible. Genetic causes of low-tone sensorineural hearing loss. Papers are easy to publish about genetic hearing loss conditions, so the literature is somewhat oversupplied with these. That being said, genetic conditions should not be your first thought when you encounter a patient with LTSNHL. If there is a family history you should be thinking about this. Bespalova et al (2001) reported that low frequency SNHL may be associated with Wolfram syndrome, an autosomal recessive genetic disorder (diabetes insipidus, diabetes mellitus, optic atrophy, and deafness). One would think that diabetes insipidus is so rare that hearing loss is probably not the main reason these individuals are seeking attention. In other words, Wolfram's is probably not diagnosed mainly by ENT's or audiologists, but rather by renal medicine doctors, as DI is exceedingly rare, while LTSNHL is not so rare in hearing tests. Bramhall et al (2008) a reported that "the majority of hereditary LFSNHL is associated with heterozygous mutations in the WFS1 gene (wolframin protein). There have been many other reports (e.g. Cryns et al, 2003; Fukuoka et al, 2007; Goncalves et al, 2014). Bille et al (2001) reported two families with low-tone hearing loss. There are numerous other papers. There are also a number of occasional reports of non-Wolfram genetic LTSNHL. Bom et al (2002) reported another family linked to DFNA6/14. Gurtler (2004), another DFNA family. Yoshida reported LFSNHL in a patient with a SLC26A4 mutation. Central lesions as causes of low tone sensorineural hearing loss. Eckert et al(2013) suggested that cerebral white matter hyperintensities predict low frequency hearing in older adults. We are dubious that this is true. See the later section on age where Gates suggests that LFSNHL is due to strial atrophy. Fukaya et al (1991) suggested that LFSN can be due to microinfarcts in the brainstem during surgery. These patients are extremely rare because there isn't much microsurgery done close to the brainstem. Ito et al (1998) suggested that bilateral low-frequency SNHL suggested vertebrobasilar insufficiency. Yurtsever et al (2015) reported low and mid-frequency hearing loss in a single patient with Susac syndrome. (a vasculitis involving the brain, eyes and ear). These patients are extremely rare. Omichi et al (2016) reported that low-tone hearing loss was higher in spinocerebellar degeneration and multiple-system atrophy C and cortical cerebellar atrophy. We find it difficult to see how these purely central disorders could cause LTSNHL. We have not observed this pattern in our own patient population either. Nevertheless, it is wise to keep one's mind open. There are an immense number of reports of LTSNHL after spinal anesthesia and related conditions with low CSF pressure. One would wonder if looking for LTSNHL shouldn't be part of the protocol for diagnosis. Fog et al (1990) reported low frequency hearing loss in patients undergoing spinal anesthesia where a larger needle was used. This is likely part of the story with hydrops and low spinal fluid pressure. Gultekin et al (2002) also reported LTSNHL after spinal anesthesia. Hussain et al also reported LTSNHL, as did Nakaya after myelography (2005). Grant et al (1985) reported transient LFSNHL following myelography. Similar reports are due to Isildak et al (2010). Schaffartzik et al (2000) suggested that LFSNHL was "Correlated with intraoperative volume replacement". We are dubious about the conclusion of this paper because it is different than nearly every other paper in the literature. Stoeckli noted persistent bilateral LTSNHL after shunt placement. Waisted et al (1991) suggested that LFSNHL after spinal anesthesia was due to low perilymph pressure. Wang et al reported hearing reduction after prostate surgery with spinal anesthesia (1987). Gates et al (1991) suggested that low tone deterioration with age was due to "strial atrophy or other intracochlear processes". We do sometimes observe mysterious low-tone deterioration in older people. We do not know why. Horner et al (1997) reported that lithium causes low frequency hearing loss in guinea pig. We are dubious that this has any applicability to humans and we have never seen a patient with lithium toxicity with any LFSNHL. Guinea pigs may be special. Kanaan et al reported a single case of low tone SNHL with bilateral SCD. SCD stands for superior canal dehiscence. We have observed this occasionally ourselves, but of course, the usual pattern is a conductive hyperacusis. Kenny reported a case of sudden LTSNHL after delivery. We find this somewhat plausible as pregnancy and delivery might be associated with spinal anesthesia, with changes in collagen, and with gigantic changes in hormonal status. That being said, it is very rare to encounter any substantial change in hearing after pregnancy. Low tone hearing loss 6 years post Herpes Zoster on the right Sweep OAE done 1 year after Herpes Zoster on the right. Note preserved low frequencies. We have encountered a patient, about 50 years old, with a low-tone sensorineural hearing loss that occurred in the context of a herpes zoster infection (Ramsay Hunt). Her hearing improved, and remained stable for 5 years thereafter. 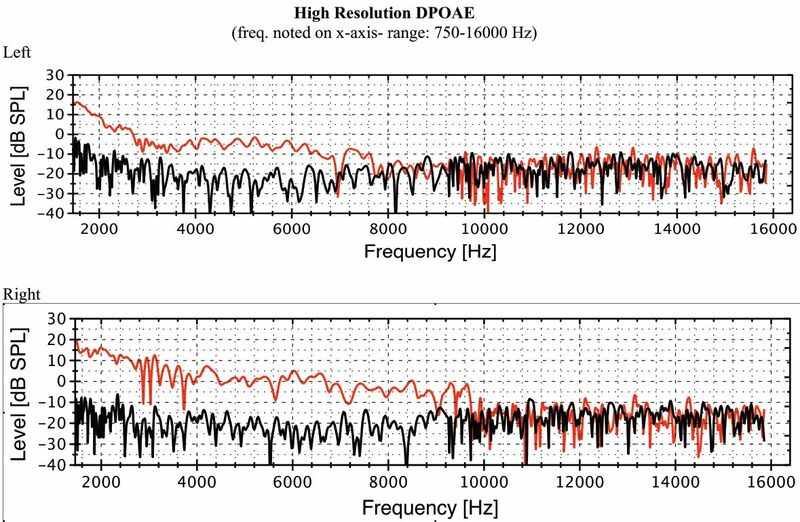 OAE testing was intact at low frequency. This may be a neural type LTSNHL. There is very little written about hearing loss in Ramsay Hunt. LTSNHL is generally viewed as either a variant of Meniere's disease or a variant of sudden hearing loss, and the same medications are used. The most common ones are diuretics and steroids. According to Im et al (2016), prognosis was excellent (in their uncontrolled study). We suspect prognosis would be equally good without any treatment. According to Sato et al (2017), female gender, younger age, low-grade hearing loss, and a shorter interval between onset and initial visit were significantly predictive of a good prognosis. Most of these observations are rather obvious -- less hearing loss, being younger, and not having a long history of being deaf already are naturally associated with better prognosis. The main surprise is female gender. Perhaps this relates to a different distribution of mechanism (e.g. more migraine in females). Asakuma, S. (1999). "[Acute low-tone sensorineural hearing loss]." Nihon Jibiinkoka Gakkai Kaiho 102(3): 299-304. Belinchon, A., et al. (2011). "Hearing assessment in Meniere's disease." Laryngoscope 121(3): 622-626. Bespalova, I. N., et al. (2001). "Mutations in the Wolfram syndrome 1 gene (WFS1) are a common cause of low frequency sensorineural hearing loss." Hum Mol Genet 10(22): 2501-2508. Bille, M., et al. (2001). "Two families with phenotypically different hereditary low frequency hearing impairment: longitudinal data and linkage analysis." 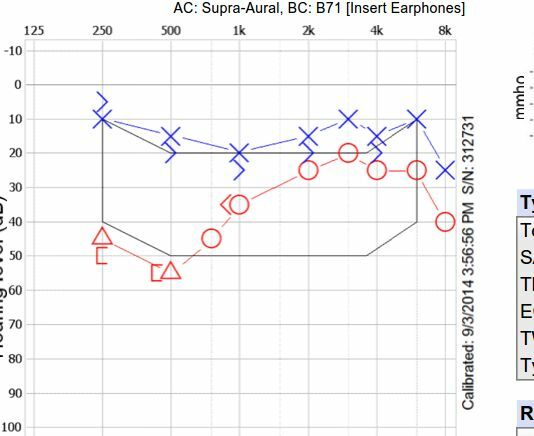 Scand Audiol 30(4): 246-254. Bom, S. J., et al. (2002). "Autosomal dominant low-frequency hearing impairment (DFNA6/14): a clinical and genetic family study." Otol Neurotol 23(6): 876-884. Bramhall, N. F., et al. (2008). "A novel WFS1 mutation in a family with dominant low frequency sensorineural hearing loss with normal VEMP and EcochG findings." BMC Med Genet 9: 48. Brannstrom, K. J. and J. Grenner (2008). "Long-term measurement of binaural intensity and pitch matches. II. Fluctuating low-frequency hearing loss." Int J Audiol 47(11): 675-687. Brodwolf, S., et al. (2001). "Further evidence for linkage of low-mid frequency hearing impairment to the candidate region on chromosome 4p16.3." Clin Genet 60(2): 155-160. Cryns, K., et al. (2003). "The WFS1 gene, responsible for low frequency sensorineural hearing loss and Wolfram syndrome, is expressed in a variety of inner ear cells." Histochem Cell Biol 119(3): 247-256. Eckert, M. A., et al. (2013). "White matter hyperintensities predict low frequency hearing in older adults." J Assoc Res Otolaryngol 14(3): 425-433. Fog, J., et al. (1990). "Hearing loss after spinal anesthesia is related to needle size." Anesth Analg 70(5): 517-522. Fukaya, T., et al. (1991). "Transient retrocochlear low-frequency sensorineural hearing loss: a new clinical entity." Laryngoscope 101(6 Pt 1): 643-647. Fukuoka, H., et al. (2007). "Mutations in the WFS1 gene are a frequent cause of autosomal dominant nonsyndromic low-frequency hearing loss in Japanese." J Hum Genet 52(6): 510-515. Gultekin, S. and S. Ozcan (2002). "Does hearing loss after spinal anesthesia differ between young and elderly patients?" Anesth Analg 94(5): 1318-1320, table of contents. Gurtler, N., et al. (2004). 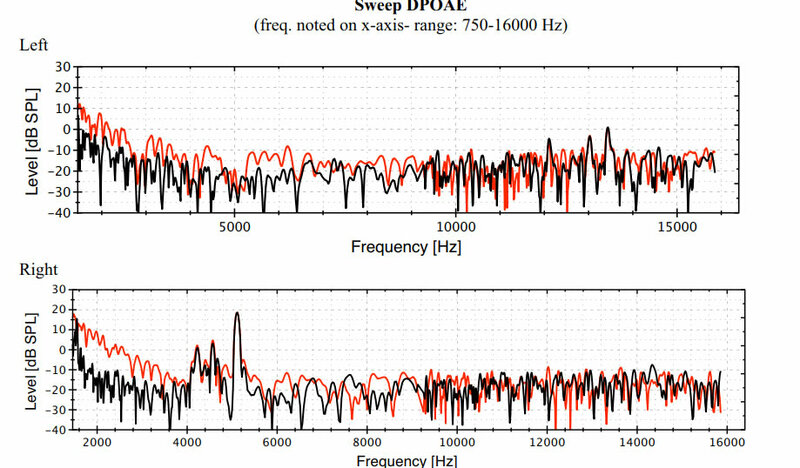 "DFNA54, a third locus for low-frequency hearing loss." J Mol Med (Berl) 82(11): 775-780. Goncalves, A. C., et al. (2014). "WFS1 and non-syndromic low-frequency sensorineural hearing loss: a novel mutation in a Portuguese case." Gene 538(2): 288-291. Grant, M. G., et al. (1985). "Transient hearing loss with metrizamide." Laryngoscope 95(1): 67-69. Gates, G. A. and J. C. Cooper (1991). "Incidence of hearing decline in the elderly." Acta Otolaryngol 111(2): 240-248. Gatland, D., et al. (1991). "Hearing loss in chronic renal failure-hearing threshold changes following haemodialysis." J R Soc Med 84(10): 587-589. Horner, K. C., et al. (1997). "Reversible hearing impairment induced by lithium in the guinea pig." Neuroreport 8(6): 1341-1345. Hussain, S. S., et al. (1996). "Hearing loss following spinal anaesthesia with bupivacaine." Clin Otolaryngol Allied Sci 21(5): 449-454. Isildak, H., et al. (2010). "Spontaneous intracranial hypotension syndrome accompanied by bilateral hearing loss and venous engorgement in the internal acoustic canal and positional change of audiography." J Craniofac Surg 21(1): 165-167. Ito, F., et al. (1998). "Vertigo secondary to hypotension: the relationship between therapeutic effects and hearing." Auris Nasus Larynx 25(2): 161-167. Jun, H. J., et al. (2012). "Analysis of frequency loss as a prognostic factor in idiopathic sensorineural hearing loss." Acta Otolaryngol 132(6): 590-596. Kanaan, A. A., et al. (2011). "Bilateral superior semicircular canal dehiscence in a child with sensorineural hearing loss and without vestibular symptoms." Int J Pediatr Otorhinolaryngol 75(6): 877-879. Le Prell, C. G., et al. (2011). "Evidence of hearing loss in a 'normally-hearing' college-student population." Int J Audiol 50 Suppl 1: S21-31. Kenny, R., et al. (2011). "Sudden (reversible) sensorineural hearing loss in pregnancy." Ir J Med Sci 180(1): 79-84. Nakaya, M., et al. (2005). "Recurrent hearing loss after myelography treated with epidural blood patch." Auris Nasus Larynx 32(4): 399-401. Oishi, N., et al. (2010). "Long-term prognosis of low-frequency hearing loss and predictive factors for the 10-year outcome." Otolaryngol Head Neck Surg 142(4): 565-569. Rahko, T. and P. Karma (1990). "Low- and high-frequency hearing in patients with Meniere's disease." Eur Arch Otorhinolaryngol 247(5): 329-332. Sato, H., et al. (2017). "Epidemiological survey of acute low-tone sensorineural hearing loss." Acta Otolaryngol: 1-4. Schaffartzik, W., et al. (2000). "Hearing loss after spinal and general anesthesia: A comparative study." Anesth Analg 91(6): 1466-1472. Stoeckli, S. J. and A. Bohmer (1999). "Persistent bilateral hearing loss after shunt placement for hydrocephalus. Case report." J Neurosurg 90(4): 773-775. Yoshida, T., et al. (2017). "Idiopathic sudden sensorineural hearing loss and acute low-tone sensorineural hearing loss: a comparison of the results of a nationwide epidemiological survey in Japan." Acta Otolaryngol: 1-6. Walsted, A., et al. (1991). "Low-frequency hearing loss after spinal anesthesia. Perilymphatic hypotonia?" Scand Audiol 20(4): 211-215. Wang, L. P., et al. (1987). "Transient hearing loss following spinal anaesthesia." Anaesthesia 42(12): 1258-1263. Yoshida, T., et al. (2015). 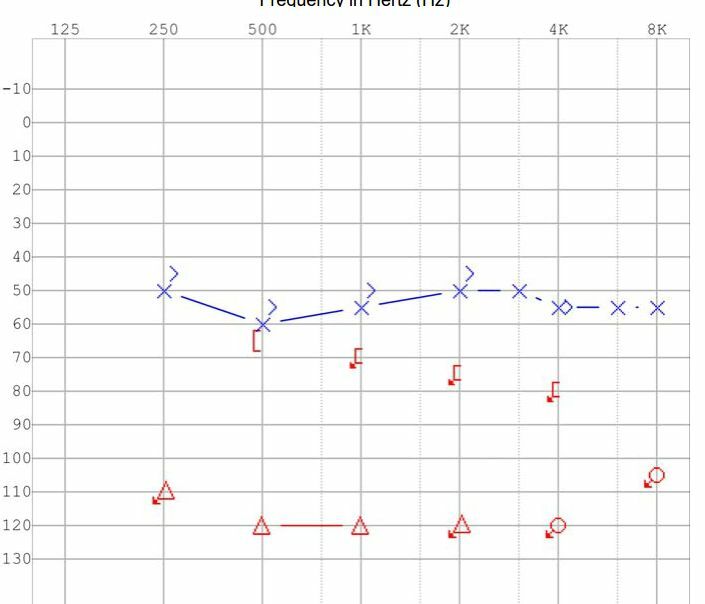 "Patient with an SLC26A4 gene mutation who had low-frequency sensorineural hearing loss and endolymphatic hydrops." J Laryngol Otol 129(1): 95-97. Yurtsever, B., et al. (2015). "A Rare Cause of Hearing Loss: Susac Syndrome." J Int Adv Otol 11(2): 167-169.